This 1899 photograph bears the caption "Valley of Hinnom, showing the Jewish Colony, Palestine." The long flat buildings belong to "Mishkenot Sha'ananim," the first neighborhood built outside of the Old City and intended as housing for indigent Jews. The first row was built by philanthropist Moshe Montifiore in 1860; the second row was built in 1866. The windmill, part of the Yemin Moshe project built in 1891, was meant to provide employment for the Jews, but it never operated. But who is the man in the foreground? Almost certainly, he's a Yemenite Jew, characterized by the sidecurls (peyot) and probably from the nearby Silwan/Shiloah Jewish village. 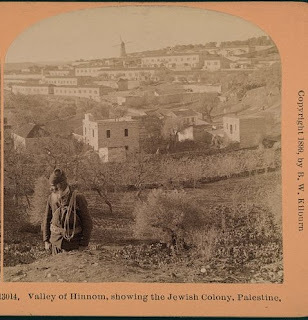 Presented here last month was the picture of a Yemenite Jew (left) standing in front of the village in a picture taken around the same time, also in a "stereograph" format. The photographers of the time were apparently intrigued by the newly-arrived exotic Jews. 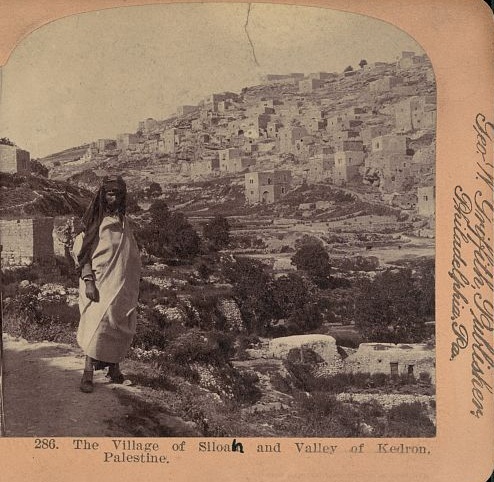 In 1881-1882 a group of Jews of Yemen arrived by foot to Jerusalem. The new immigrants settled on Jewish-owned property in the Silwan/Shiloah Village outside of the Old City walls of Jerusalem. In the 1948 war and its aftermath the Mishkenot Sha'nanim neighborhood was a battleground between Jewish forces (and then the Israel army) and the Jordanian army. 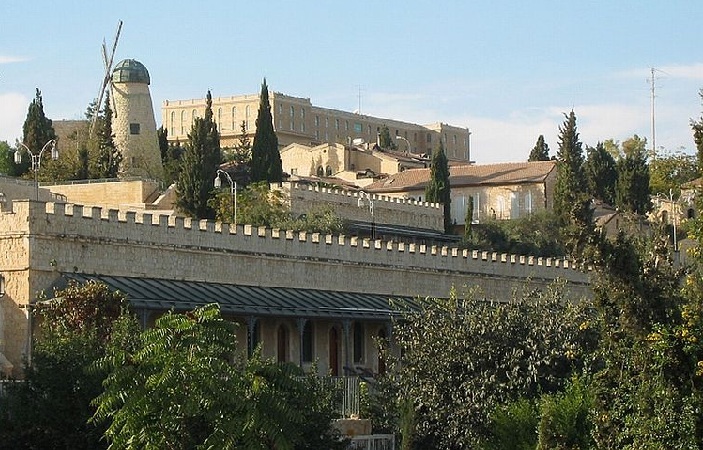 The buildings in the no-man's land remained uninhabited and in ruins until Israel reunited the city in 1967 and rebuilt the neighborhood.